The glare of the spotlight, the flamboyant costumes donned during competition, the students who followed every stomp of her feet and swing of the hips. It all suited the self-described “mover and shaker” with an infectious personality to a tee. But at the peak of her ballroom prowess, the lights began to dim and the music came to a stuttering stop as her health seriously deteriorated. Aged 19, May had been diagnosed with systemic lupus, a chronic condition that causes the body’s immune system to attack healthy tissue. Although its symptoms can often be mild and manageable, hers gradually become more severe. By her early 20s, arthritis had set in and ulcers soon appeared all over her body. Her skin, hair, joints and lungs were all affected. She was bedridden for months at a time, barely able to breathe. There were even painful episodes of chemotherapy to save her kidneys. “I was in the hospital for long periods and I thought I was going to die many times,” she reveals. Bouts of anxiety and deep depression soon followed, affecting her confidence and straining relationships with those close to her — even as her physical condition improved. Now 32, May lives independently in an apartment owned by the Friendship Shelter, a charity based in Laguna Beach, California. Work is still out of the question because her illness often restricts her mobility. She speaks glowingly of the friends and social workers who have helped her get to a place where she can now at least cope with her illness both mentally and physically. But there is one other treatment she credits as having helped her get through the pain — equine-assisted psychotherapy (EAP). Twice a month, May attends healing sessions run by Otra Mas at the Ortega Equestrian Center in San Juan Capistrano, near Los Angeles. The EAP program is owned and operated by the company’s president Katherine Holman. All of the horses involved have been donated to Otra Mas, Holman explains. Many are old show horses that have succumbed to injury or would have otherwise been put down. 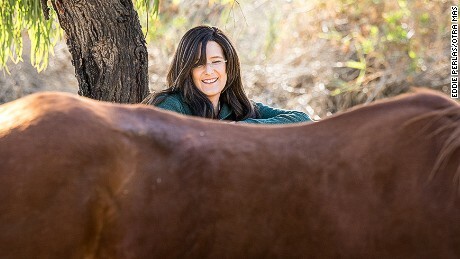 Yet despite their advancing age, these horses can still live fruitful and purposeful lives and are the ideal companions for therapy, says Carol Caddes, a licensed marriage and family therapist who runs the program. Being natural herd animals, horses are constantly looking to form bonds and relationships, Caddes says. This can be with other horses but also people when they are introduced into their environment. When horses begin responding to a person, it can help a patient identify and confront these issues, Caddes explains. It can also give therapists supervising from the sidelines an insight into the emotional state of the individual. 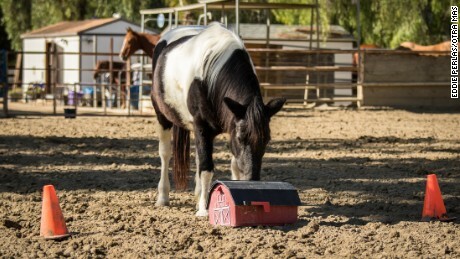 “Horses react and want to connect with a person or another horse that is authentic, grounded, present and has a coherent heart rate,” Caddes says. Any observations can be noted and brought up in debrief sessions later. 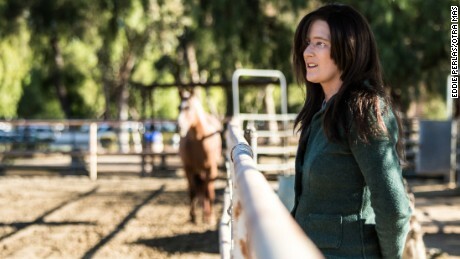 For those who find sitting on a couch and opening up to a therapist too awkward, Caddes adds, equine psychotherapy can also offer an experiential, here-and-now alternative. Using animals in human therapy sessions is not a new idea. Psychoanalysis pioneer Sigmund Freud believed dogs helped his patients relax, while dolphins were used to treat people with mental health disorders in the former Soviet Union. In recent years, EAP programs have also been set up in Colorado, Utah, Minnesota and beyond. In England, similar projects have been organized to treat people with attention deficit disorder, anxiety and chronic pain, while in Germany a research center founded in 2011 aims to scientifically substantiate the human benefits of horse-assisted interventions. May, born in Columbus, Ohio, believes the sessions have equipped her with an emotional resilience. Being asked to observe, groom and interact with highly sensitive creatures like horses has also taught her to become more aware of herself and her surroundings. 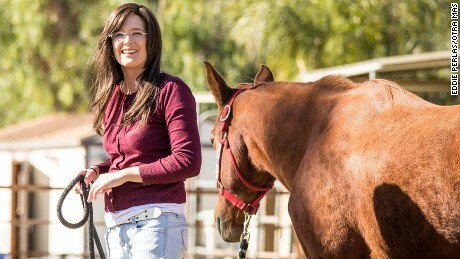 She cites forging a connection with an old show horse named Demi — who, like her, suffers from severe arthritis — as a particular breakthrough. She has also benefited from exercises designed to challenge maintaining the relationship she had built with various horses. On one occasion, May was asked to create a pool table in the center’s equestrian arena, using various obstacles and props for pockets. The idea was to gently persuade the horse to move into one of the pockets by showing authority, but without breaking the bond of trust built up in previous routines. In another, she drew on the horse’s back with chalk, outlining the different scenarios relating to her current situation and where she wanted get to. This last exercise ended up having a profound effect. May describes etching out her fears of physical and financial hardships caused by her illness, as well as emotional insecurities and “messed-up relationships.” She then drew how she wanted her life to be and how she would reach that goal. “It was kind of a wake-up call for me. It was like, ‘Oh my gosh, people are here for me.’ But in order to get this peace, there are certain things I have to do,” she says. Despite the positive results experienced by May, however, rigorous research on equine psychotherapy remains relatively thin compared to other areas of psychiatric study. A 2012 research paper published in the Journal of Student Research did investigate whether there was some evidence of horses regulating their heart beats to mirror that of humans undergoing therapy. Although its findings did not support the theory, it recognized there were “positive benefits” of EAP. Yet according to professor Lawrence C. Rubin, director of the mental health counseling faculty at St. Thomas University in Miami and author of several books on psychotherapy in popular culture, the lack of detailed literature isn’t necessarily problematic. He invokes revered psychiatrist Irvin Yalom by stating that just because a method hasn’t been validated doesn’t mean it is not valid. As long as the therapy is carried out under the supervision of a certified professional with the relevant qualifications, Rubin says it can be relevant to individual patients. At Otra Mas, more than 200 people have taken part in therapy since it opened in 2013, including those suffering from from depression, anger management issues and post-traumatic stress disorder. “I think it helps me go through a lot of my physical pain by myself instead of being so dependent on others to take me out of the emotional pit,” May says. “You see how horses interact with each other and it’s similar to how people interact with each other. They’re non-judgmental and don’t take things personally. It taught me to be that way with other people and not feel uptight.